For the Italian commune, see Gonzaga, Lombardy. 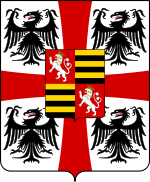 The House of Gonzaga (Italian: [ɡonˈdzaːɡa]) was a princely family that ruled Mantua, in Northern Italy, from 1328 to 1708; they also ruled Monferrato in Piedmont and Nevers in France, and also many other lesser fiefs throughout Europe. Their family includes a saint, twelve cardinals and fourteen bishops. Two Gonzaga descendants became Empresses of the Holy Roman Empire (Eleonora Gonzaga and Eleonora Gonzaga-Nevers), and one became Queen of Polish-Lithuanian Commonwealth (Marie Louise Gonzaga). The coat of arms of the Duchy of Mantua. The first members of the family of historical importance are known to have collaborated with the Guelph faction alongside the monks of the Polirone Abbey. 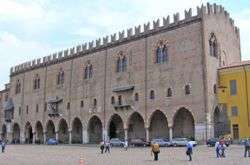 Starting from the 12th century they became a dominant family in Mantua, growing in wealth when their allies, the Bonacolsi, defeated the traditional familiar enemy, the Casalodi. In 1328, however, Ludovico I Gonzaga overthrew the Bonacolsi lordship over the city with the help of the Scaliger, and entered the Ghibelline party as capitano del popolo ("people's captain") of Mantua and imperial vicar of emperor Louis IV. Ludovico was succeeded by Guido (1360–1369) and Ludovico II (1369–1382), while Feltrino, lord of Reggio until 1371, formed the cadet branch of the Gonzaga of Novellara, whose state existed until 1728. Francesco I (1382–1407) abandoned the traditional alliance with the Visconti of Milan, in order to align their rising power with the Republic of Venice. In 1433, Gianfrancesco I assumed the title of Marquis of Mantua with the recognition of Emperor Sigismund, while obtaining recognition from the local nobility through the marriage of his daughter Margherita to Leonello d'Este, Marquis of Ferrara in 1435. In 1530 Federico II (1500–1540) received the title of Duke of Mantua. In 1531, the family acquired the Marquisate of Montferrat through marriage. Through maternal ancestors, the Gonzagas inherited also the Imperial Byzantine ancestry of the Paleologus, an earlier ruling family of Montferrat. 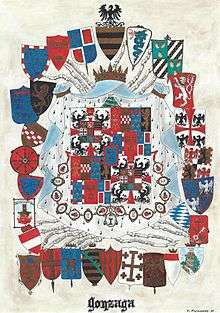 A cadet branch of the Mantua Gonzagas became Dukes of Nevers and Rethel in France when Luigi (Louis) Gonzaga, a younger son of Federico II Gonzaga, Duke of Mantua and Margherita Paleologa, married the heiress. The Gonzaga-Nevers later came to rule Mantua again when Louis's son Charles (Carlo) inherited Mantua and Montferrat, triggering the War of the Mantuan Succession. Another cadet branch were first sovereign Counts, later Dukes of Guastalla. They descended from Ferrante, a younger son of Duke Francesco II of Mantua (1484–1519). Ferrante's grandson, Ferrante II, also played a role in the War of the Mantuan Succession. A further cadet branch was that of Sabbioneta, founded by Gianfrancesco, son of Ludovico III. Marie Louise Gonzaga, daughter of Prince Charles Gonzaga-Nevers, was a Polish queen consort from 1645 to her death in 1667. Two daughters of the house, both named Eleanor Gonzaga, became Holy Roman Empresses, by marrying Emperors Ferdinand II of Germany and Ferdinand III, Holy Roman Emperor, respectively. From the latter Empress Eleanor, the current heirs of the Gonzaga descend. St. Aloysius Gonzaga was a member of a junior branch of this family. Gonzaga rule continued in Mantua until 1708 and in Guastalla until 1746. Both ruling lines became extinct, and the headship of the House of Gonzaga passed to the Vescovato line, descended from Giovanni, a son of Federico I Gonzaga. That branch, shorn of sovereign domains, is extant. Its head is Don Corrado Alessandro Gonzaga, Principe del Sacro Romano Impero, Marchese Gonzaga, Conte di Villanova, Conte di Cassolnovo, Marchese del Vodice, Signore di Vescovato, Patrizio Veneto (b. 1941). The branches of the Gonzaga family, showing Marquises and (subsequently) Dukes of Mantua in bold, Dukes of Nevers and Rethel in italics and the Guastalla line to the right. ↑ Francesca Cappelletti; Gerlinde Huber-Rebenich (1997). Der Antike Mythos und Europa. Gebrüder Mann Verlag. p. 250. ↑ "GONZAGA: LINEA PRINCIPESCA DI VESCOVATO". Libro d'Oro della Nobiltá Mediterranea (in Italian). Società Genealogica Italiana. 2004-03-15. Retrieved 2012-05-18. Wikimedia Commons has media related to House of Gonzaga.